Client -- Carlsberg is the 4th largest brewery group in the world employing around 45,000 people. Challenge -- For the trade fair “Venues” in Antwerp, Carlsberg asked their agency “Mighty” to do something extra… Something that would give the booth visitors a Carlsberg Experience. 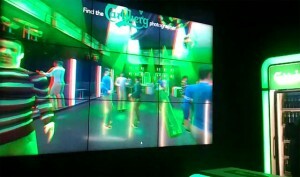 The GriN-solution - We created an augmented 3D experience where the user can check out a virtual Carlsberg bar. The user stands in front of a huge 3D screen (anaglyph 3D, you know, with those red/green glasses) with a Carlsberg bottle in hand (Wii-controller inside) to navigate through the bar. Goal of the installation is to get a beer at the bar and find the photographer in the crowd. The installation takes a picture and saves it to harddrive for later use on website and social media.